I recently did a class where we used a wing needle. We tried different stitches on the machine to see what the results would be. As everyone tried the different stitches, they shared the results with others in the class. Each person kept their samples and made a note of the stitch that they used for that sample. It was a fun to see everyone enjoy creating beautiful stitches with a wing needle. If you have never used a wing needle, now might be the time to try one. A WING NEEDLE is used to produce beautiful heirloom sewing effects. Use those heirloom stitches on your sewing machine and a natural fabric and fine thread for the best results. When the needle goes through the fabric, the wings push the yarns of the fabric to the sides, creating holes. The more often the needle goes through the same hole, the more pronounced the opening is. 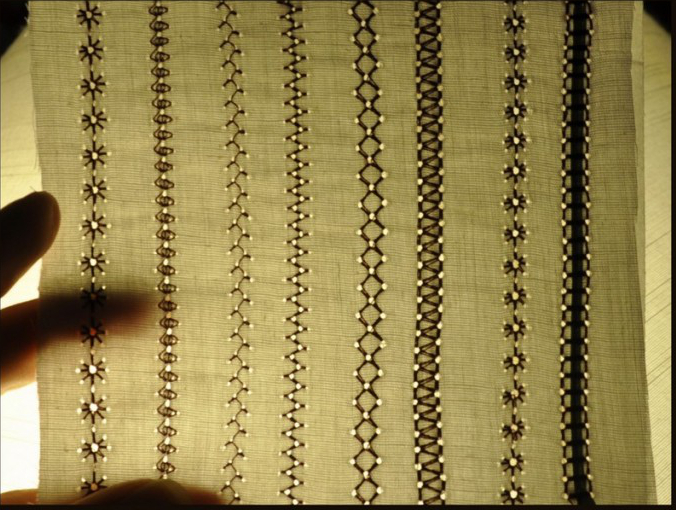 Most machines have decorative stitches that can be used to create even more intricate decorative effects, such as blanket stitch, honeycomb, stars – even stitches designed to produce the look of purchased entredeux. Wing needle stitching is a quick and easy embellishment for purchased items – linen and/or cotton shirts, tablecloths & napkins – anywhere you want a subtle decorative touch. stitches. Stitch a test design first to make sure that you are happy with the results. When using a wing needle in embroidery, slow down the speed of stitching on your machine. Do not use your needle threader with a wing needle. 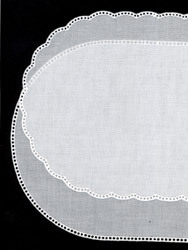 Use a light weight embroidery thread, the same or one shade darker than your fabric. Use some stabilizer under your fabric, and if the holes are not defined enough, use a double layer. 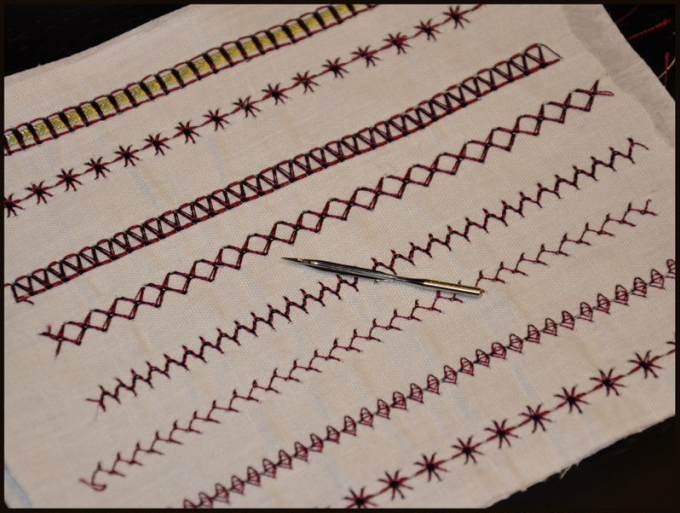 Go slow, and try not to stop while stitching, this can cause an uneven and misaligned row of stitches. Natural and loosely woven fabrics work the best. This entry was posted in Notions Know-How FYI, Sewing FYI, Tips/Techniques FYI and tagged embroidery, heirloom, Sewing FYI, wing needle on September 9, 2011 by sewvacoutletblog. Brad Porterfield is the owner of Humble Sewing Center. He's been in the sewing machine and vacuum business since the late 70’s. In the early days, Brad started from the ground up in sales, service, and repair as an employee of a sewing machine store in Arkansas. He eventually became a factory trained technician for all brands including: Elna, Viking, Brother, Singer, Bernina, Janome, and Babylock. Brad later decided to venture out into retail and has successfully owned and operated a number of prosperous sewing machine stores including Meyerland Sewing Center. He purchased Humble Sewing Center in 1997 from the original owner, Bob Crain. Brad remains committed to quality and premium customer service. Humble Sewing Center continues to serve the Houston, Humble, Kingwood, and Atascocita areas, and we look forward to seeing you soon. Pretty! I want to try this. Do you use a stabilizer even on your regular sewing machine? Very pretty! Also remember not to use an auto thread cutter ( if your machine has one). I have heard the you can do hem stitching with the wing needle. Can you tell me how.